Hi lovelies! 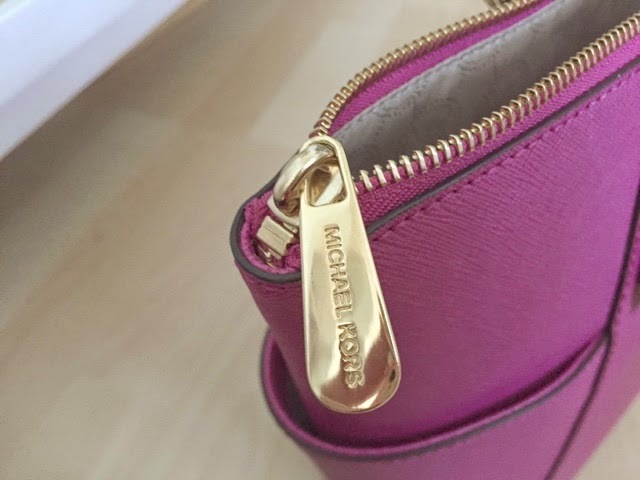 It's a bit unusual of me to do a review of anything other than a hair or beauty product, but as you can see, this is something that I have a lot of love for, so I thought I'd review my favourite ever handbag(s) the Michael Kors Top Zip Jet Set Tote. As you can probably tell, it's definitely my favourite style of handbag as I have in three colours (so far!). 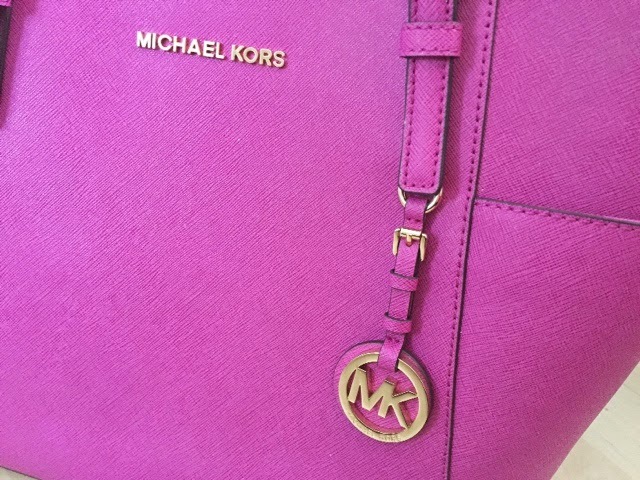 I've got one other Michael Kors bag, which is a Jet Set Travel tote and while that is absolutely perfect for going anywhere where you need to carry a little extra (and it's baby pink, so it's super pretty! 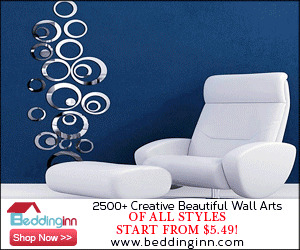 ), these are the perfect size for every day. First things first, Michael Kors is my absolutely favourite brand for handbags for a number of reasons, first, the obvious, they're beautiful. I love that they have such a huge range of colours and styles but are all very classic and elegant, nothing too crazy, which brings me onto my next point, they're timeless. Despite having some fun colours, the actual style of MK bags is generally very simple and chic, meaning they never go out of style. I personally believe that accessories such as jewellery, watches and handbags are a better investment than designer clothes. Clothes tend to go out of style quickly, but bags and jewellery are timeless when you get them right, give me a MK bag and a pair of Topshop skinny jeans over a cheap bag and Burberry coat any day! Obviously they aren't the cheapest handbags out there (the Jet Set Zip Top retails at £220 in the UK), as designer bags go, they're certainly not the most expensive either, making them a fab investment piece when you don't want to part with too much of your hard earned cash! The quality is incredible aswell, with a lot of bags, people will often say 'it looks better as it wears' but I disagree, I like my handbags to look shiny and new and to stay that way, which these bags definitely do. Obviously, you have to take care of it as with anything, but if you do, these stay gorgeous and keep their shape for a long time. As for why I love this model in particular, as I said, it's such a great size for everyday. For me, small bags are not an option for everyday. I carry a full makeup bag, hairbrush, purse, keys, phone, iPad, umbrella and various other bits and bobs and this fits all of that really well. I find it fits everything I absolutely need perfectly, but doesn't leave so much room that I end up filling my bag up with other rubbish that I don't need in there. It has a zip pocket inside as well as four other little pockets, fab for hold your phone and keys and whatever other small things that you don't want floating freely around your handbag. 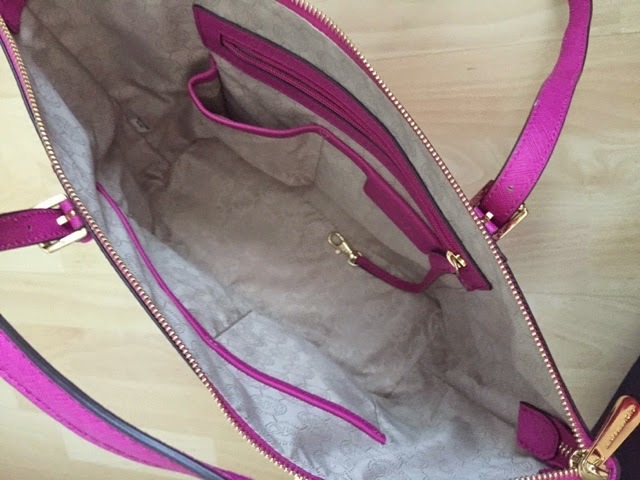 One thing I absolutely always look for in a handbag is a zip across the top, I cannot deal with bags that don't zip up, purely because I carry so much stuff around that I'd be terrified of things falling out! I'm also not keen on passers by, people on the train or any other nosey randomer being able to have a nose into my bag! Another great thing for me is the strap, it's long enough that it can be comfortably worn on your shoulder, but short enough that it can be carried in the crook of your arm without looking odd. I don't generally do cross body bags and while I do generally carry my bag on my arm, I like to have the option of putting it on my shoulder too if necessary. Overall, if you're on the hunt for a handbag that's big enough for all your daily essentials, but not too big and if you love a timeless, classic handbag that keeps its colour and shape, then this is absolutely for you. As I've said, I do think designer bags are worth the investment, as cheaper bags (at least I. My experience) do always eventually lose their shape or fade in colour or just literally fall apart (is there anything more annoying than a ripped inside pocket on a handbag? 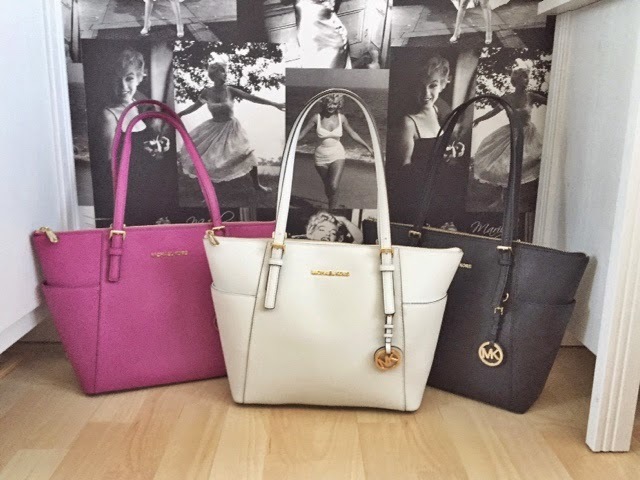 ), so if you're on the lookout, the Michael Kors Zip Top Jet Set Tote is definitely worth checking out. What do you think? What's your favourite style of handbag? I adore their bags, their gold embellishments always win it for me. And I am the exact same, expensive bags over clothes!